Networking | JDC Systems Innovations, Inc. Managing your network environment is crucial to your success. Making sure it is operating at its peak performance level and ensuring security from the outside world is of paramount importance in this day and age. Networks today have become more complicated as technology advances. A typical network comprises of the following minimally listed components. Firewalls – This device handles the traffic further by inspecting it and applying rules that will or will not allow the data to continue. Switches – This device connects all your servers, computers, printers, VoIP and shares the connection to the outside world. Wireless Access Points – This devices extends your LAN to allow access to wireless devices such as printer, laptops and hand held devices. 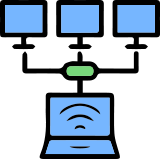 Servers – Both hardware and software versions, is responsible for sharing and communications your resources from the network to the individual computer. Computers – These are the actual workstations and/or laptops that are used by the employees to perform their daily functions to provide the services required. Printers – These devices generate hard-copy that the employees require from time to time. Online storage documents have placed less reliance on these devices. Telephony – Voice over Internet Protocol (VoIP) has replaced the old plain old telephone service (POTS) and has increased to the demand of a more robust network environment. JDC Systems can provide engineering and administrative operations and support to make sure you can deliver your services or products to your client or target audience.